Ko Wen-je (left) with Sha Hailin, head of the CCP United Front Work Department's Shanghai Municipal Committee, during the 2016 edition of the Taipei-Shanghai Forum. A 135-member delegation from Shanghai helmed by Executive Vice Mayor Zhou Bo has arrived in Taipei to participate in a twin-city forum from December 19 to 21. The Taipei-Shanghai twin-city forum, which has been held since 2010 and alternates between the two cities, comes amid suspicion over Taipei Mayor Ko Wen-je’s alleged warmth toward Beijing ahead of a potential presidential run in 2020. Despite this, Ko announced the date of this year’s forum just after his election victory. 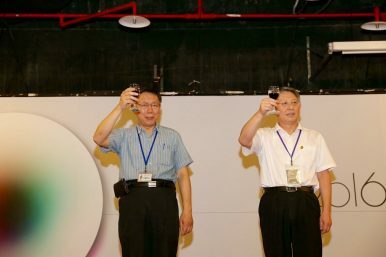 The 2018 event will focus on circular economy initiatives, a hallmark policy of Ko and national DPP leaders alike and a contributor to Taiwan’s success in reducing waste and improving the country’s recycling rate. Officials will also discuss culture, urban renovation, and environmental matters, according to the Taipei city government. The chatter surrounding the forum, however, has focused not on waste reduction schemes but on the potential motives of its participants. Ko, who is said to be planning a trip to the United States in 2019 ahead of a potential presidential bid, told Bloomberg in October that Taiwan is “just a product on a shelf” for the United States in its trade war with China. His apparent views contrast heavily with officials in the administration of President Tsai Ing-wen, which has warmed to the U.S. while distancing itself from China. Taiwan’s incoming KMT mayors have shown interest in potentially replicating the twin-city exchange model pioneered by Shanghai and Taipei, which is traditionally a “deep-blue” (pro-KMT) municipality. Kaohsiung mayor-elect Han Kuo-yu said he has already formed a working group in his administration to plan for municipal-level exchanges with China based on the principles of the “1992 Consensus” between China and Taiwan. The consensus, which says that both governments agree that there is “one China” but disagree on what that China constitutes, is not recognized by Tsai and the DPP. The city-level exchanges allow municipal governments to bypass national-level sentiments and establish relations with the cross-strait neighbor, which remains Taiwan’s largest individual trading partner. In the past, the Taipei forums have produced a relatively mild level of public scorn. They tend to emphasize people-to-people exchanges and economic knowledge-sharing, straying well away from potential political minefields. But Ko’s tepid response to protests at a 2017 cross-strait music festival in Taipei after they were met with violence from alleged pro-unification groups sparked an uproar and ensured the DPP would not support Ko in the 2018 mayoral elections. Regardless of this, incoming Tainan mayor Huang Wei-che of the DPP recently said he was considering visiting China on a tourism marketing trip, raising the possibility that DPP-ruled cities may pursue their own city-level exchanges. Ko’s words at the 2018 Shanghai-Taipei twin-city forum will be watched carefully by observers on all sides of Taiwan’s political spectrum. Lin expressed concern that municipal leaders such as Ko were playing into the hands of Beijing’s vision of “One China” and that Ko was being used as a wedge – a sentiment sure to be repeated ad nauseam ahead of the 2020 presidential election. But Ko has never fully articulated a strong position on Taiwan’s broader relationship with China. He irked the then-ruling KMT in 2014 when he questioned the usefulness of the 1992 Consensus, instead calling for “mutual familiarity, understanding, respect and cooperation” between Taiwan and China. Since taking power in 2016, the DPP has taken an adversarial stance toward Beijing, criticizing China for political interference and drawing closer to Southeast Asian neighbors via Tsai’s signature New Southbound Policy, which aims to decrease Taiwan’s economic reliance on China. While Tsai has touted the early returns of the policy and has urged Taiwanese companies to relocate from China in response to the ongoing U.S.-China trade war, it remains uncertain whether a large-scale economic pivot away from China and toward Southeast Asia is realistic, much less a viable way to jumpstart Taiwan’s sluggish economy. Unless Ko manages to land in controversy during this week’s forum, he will likely cement his perception among voters as occupying a middle ground between the DPP and KMT. In a country where over half of voters do not identify with either major political party, that is hardly the worst place to be.